Dustin T. Wachler | Michigan Health Care Lawyers Wachler & Associates, P.C. 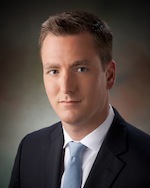 Dustin T. Wachler is an attorney at Wachler & Associates, P.C. Dustin practices in all areas of healthcare law. He devotes a substantial portion of his practice to transactional, regulatory, and Fraud & Abuse matters, including counseling healthcare providers nationwide regarding compliance with the federal Anti-Kickback Statute, Stark law, and other federal and state fraud and abuse laws. Dustin also represents all types of healthcare providers and suppliers in defense of Medicare, Medicaid, and commercial payor audits. Dustin graduated with honors from Chicago-Kent College of Law, which he attended on a Dean’s Merit Scholarship. He also attended the Benjamin N. Cardozo School of Law, where he was named to the Dean's List each semester. Dustin graduated with a B.A. in Political Science and a concentration in Public Policy from the University of Michigan. Prior to joining Wachler & Associates, P.C., Dustin's past experience includes, but is not limited to, working for the Cook County Circuit Court in Chicago, Illinois and Wayne County Corporation Counsel in Detroit, Michigan. He is also an investor and counselor to several early-stage companies, including healthcare start-ups in the United States and India. Dustin is admitted to practice in both Michigan and New York. He is a member of the State Bar of Michigan's Health Care Law Section and State Bar of New York's Health Law Section. Dustin is also a member of the American Health Lawyers Association, American Bar Association, and Oakland County Bar Association. He served as Vice Chair of the American Bar Association YLD's Health Law Committee. Dustin currently serves as a Lead Coordinator for the American Health Lawyers Association's Fraud & Abuse Practice Group. He has been appointed to a 3-year term on the State Bar of Michigan's Health Care Law Section Council, which is the board that oversees the Health Care Law Section. Dustin is the Chair of the State Bar of Michigan Health Care Law Section's New Lawyers and Law Students Committee. He also serves on the Membership Committee and Legislative Committee of the State Bar of Michigan's Health Care Law Section.